With another long winter behind them this summer was important for maintaining a minimum level of fitness for Gary’s dogs. Gary walked them out as a pack, not a traditional method given the time and effort it takes to have the breed walk tolerantly amongst one another. 400-mile, twenty-two day round trip from Inuvik to Mason River, Liverpool Bay (Amundsen Gulf) in Canada’s western Arctic. Gary was alone with nine dogs, evaluating them for future journeys. An entire winter logging over 3,000 training miles in Canada's Northwest Territories Mackenzie Delta region alone with his dogs and last year's puppies. Six weeks without daylight and forty below zero temperatures. From the Horton River in Canada's western Arctic, Gary and two huskies successfully completed a 400 mile coastal route east into Nunavut to the central Arctic community of Kugluktuk (Coppermine). Using the only maps available (those drawn up from aerial photographs taken 43 years ago) they set foot on terrain few, if any, people have seen since the ancient nomadic Inuit followed the migratory pattern of the caribou. Gary's journey was similar to the way ancient Inuit travelled throughout Arctic summers. His pack contained supplies, the dogs carried their own food and together they negotiated hundreds of river crossings. 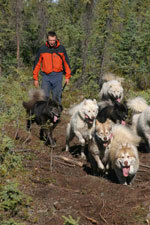 The dogs also acted as vital deterrent against six predatory grizzly bear encounters. Solo journey. 190 miles upstream over the frozen Mackenzie River with team of eight sled dogs. Gear and material testing. Temperatures fell down to -51°C. Moose encounters. Solo expedition. 400 miles with nine huskies. Built own sled. Set out from Inuvik in the western Arctic and reached Herschel Island out on the Arctic Ocean. Returned via the Yukon North Slope. Rabid fox and bear encounters. Solo expedition. 520 miles with eight huskies. From the frozen Mackenzie River to the sea ice of Mackenzie Bay in the Beaufort Sea crossing the tundra of Ellice, Pitt and Olivier Islands. Trained through entire 24-hour darkness of the Arctic winter in Canada's Northwest Territories, while based in a 13' x 8' trapper's cabin close by the mighty Mackenzie River. Wolf pack and moose encounters. Thousands of varied ice condition-training miles with huskies in Minnesota and the Canadian Wilderness Boundary Waters.